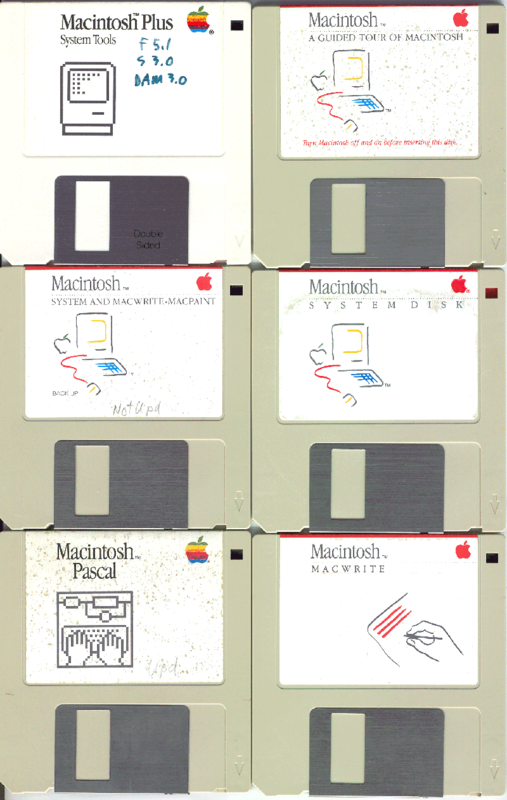 Cleaning up the office a bit, came across a box full of Mac floppies, left over from my original Mac. It was a “Fat Mac” Business Bundle, 512K RAM, 2 400K (single sided!) floppy drives, keyboard with numeric keypad (default keyboard had no numeric keypad). At the same time I got Macintosh Pascal and the Macintosh Programming Guidelines book (which was the size of a phone book and printed on similar low-grade thin paper). Total cost: $3,512.25 in about 1986 (and that was the student discount price!) purchased from the University of Manitoba bookstore. Here are some of the floppies. Five of them likely came with the original machine. The one labelled “Macintosh Plus System Tools” is from later (note that it says “double sided”) after I had upgraded the machine to a Mac Plus (swap out the system board and upgrade the floppies to double sided: 800K!). Note the handwritten version numbers: Finder 5.1, System 3.0, and DAM 3.0, whatever the heck that was. Some disks were bootable (i.e. they had System and Finder on them) while others were not, so it was important to know which were which (“System and Macwrite Macpaint”) and what version they were (cf. my “NotUpd” notation on the Macwrite/paint disk and my “Upd” notation faintly visible on the Mac Pascal disk). I wrote my thesis on this machine, using Word 3.0 for the Mac. I have the floppies somewhere, and was able to get the files off them, but I’ve been unable to reconstruct the text of the document, let alone the formatting. Luckily I have a nice hardcover version on the bookshelf. This entry was posted on Saturday, December 18th, 2010 at 6:46 pm and is filed under Photos, Software. You can follow any responses to this entry through the RSS 2.0 feed. You can leave a response, or trackback from your own site.